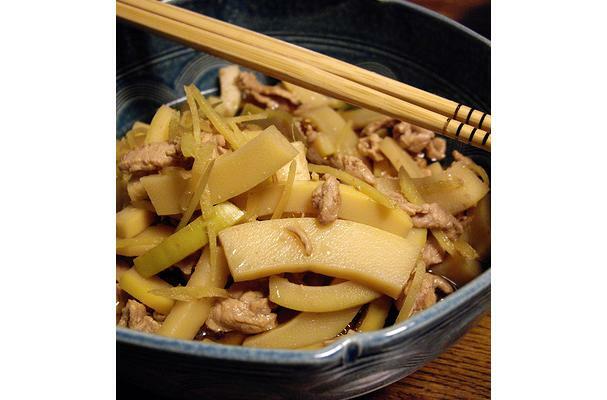 Bamboo Shoots are the young edible new growth harvested from the Bamboo Plant before they are two weeks old. Not all Bamboo varieties produce edible shoots. The most commonly used varieties include Sweet Shoot and Red Margin Bamboo. Bamboo shoots are used widely in Asian and Chinese cooking to make noddle dishes, pickles, salads, stir fries, soups and dumplings. They are have a tough exterior, and a tender inner core that is bitter and slightly sweet to taste. The outer skin must be peeled off to reveal the tender inner core and then parboiled to remove bitterness before use in cooking. They are available fresh, or parboiled and canned. When the outer layer is removed the interior is a pale yellow cone. It is also commonly sliced and canned. Choosing: Bamboo shoots are commonly found canned but can also be found fresh in Asian markets. If foraging for the shoots you must look for the baby sprouts that are only a few inches tall. Buying: Available in supermarkets in various sliced forms, both fresh and canned versions. Procuring: In certain parts of Japan, China and Taiwan the giant timber bamboo Bambusa oldhamii is harvested in spring or early summer. In Indonesia, they are sliced thinly to be boiled with coconut milk and spices to make a dish named gulai rebung.